I tend to read a lot of beer blogs these days and every so often I see a particular beer talked about across many sites that peaks my interest. I was warned that this particular beer was relatively expensive for it's size but was worth trying. So, when I saw this bottle at my local store I couldn't resist. This is the Samuel Adams Chocolate Bock from the Boston Beer Company. This beer comes in a tall 25.4oz bottle and looks to have an engraved pewter label on it. The bottle also has an information card attached to it. The $14.99 cost of this bottle made me step back a bit before buying but I was bound and determined to try it. The brew poured very dark, near black with slight mahogany edges. There was a nice tall tan head that quickly grew in the glass that had excellent lacing. So far, the look of this beer was very nice. What a remarkable aroma. There was a sweetness in the hops used here that I can't explain. As expected, there was an abundance of chocolate in the smell of this beer along with traces of vanilla and possibly honey. I guess I was expecting to be overpowered by chocolate here but there was much more to this beer. The taste? It had a nice smooth, creamy texture to it. It glided easily over the tongue. The sweetness hit my tongue up front and finished with a mild bitterness. The chocolate taste in this beer was surprisingly subtle. It was a refreshingly lighter beer than I expected. This beer isn't going to hit you like a high ABV big brew. This beer had just 5.5% ABV but looked like a beer that should have had more. There was a decent balance between the malt and hops. The Noble hops is what made this beer work for me, truly distinctive. The brew was aged on a bed of dark cocoa nibs. It was very drinkable. It's relatively low in alcohol and different enough to separate this brew from other Sam Adams beers I've tried. I liked it. It reminded me slightly of New Belgium's 1554 Black Ale but with a bit more cocoa in it. While I enjoyed drinking the entire bottle in one session, I couldn't help but think that I paid too much for this beer. It was roughly $7.50 per 12oz beer for this specialty brew. It certainly didn't taste like an expensive brew however. While tasty, I don't think I'd want to spend that much for that low alcohol style of beer again. I've had other brews with a much bigger and bolder taste for less money. In these tough economic times with people having to squeeze every last penny to get their beer money together, I doubt too many people would want to spend money like that all too often. Best to save this kind of beer for a special occasion should you choose. It was good, no doubt, but not great for the money. I'll give this beer a Thumbs Up but with a warning to buy only for curiosity's sake but not for a rebuy. Nice job Sam Adams, but I suggest you stick to producing less expensive but tasty brews. 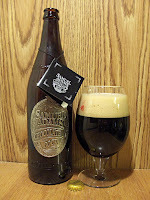 - Samuel Adams Honey Porter review. - Samuel Adams beer dinner recap.